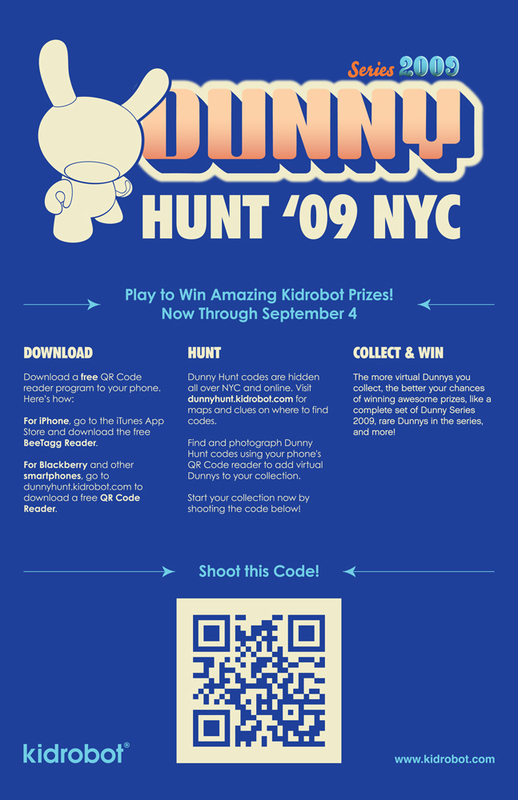 Yesterday morning Kidrobot launched a digital scavenger hunt with Dunny Hunt 2009. The premise is super easy, follow the clues to find hidden promotional items and scan them. For every one you collect, you get a chance to win free stuff; the grand prize is a complete 2009 Dunny collection. The execution is a bit more complex, and is the best use of QR Codes that I have in the US to date. Kidrobot and We Are Plus are executing the 5 day promotion using Facebook, twitter and scanning apps such as BeeTagg reader for the iPhone. Once you have registered with the Dunny Hunt website, your scans are tracked so you can see how you stack up against everyone else in the leaderboard. So far there are 26 pages of registrants on the board, with the leader having 18 of the possible 22 scanned, me being dead last at 146 with none scanned. This great news for anyone interested in using QR Codes, but has been put off a bit by the lack of ubiquity. It’s a great idea, and can generate a lot of interest in Kidrobot and Dunny. For those who don’t don’t know what a Dunny is, check out the Kidrobot website – they’re pretty cool vinyl designer series toys, like the Nightmare in Jeremyville Dunny. For more information, read the Dunny Hunt press release from We Are Plus. It’s good to see companies and agencies in the US finally coming around to a technology that has been in Japan for years. I have been writing about QR codes for over a year now off and on, having seen some cool applications in Canada as well as Australia. I even have a couple Commando Nerd patches that link back to my site – one of which is attached to my laptop bag. The largest campaign in the states that I know of is what Ralph Lauren did last year with mailings, in-store posters and graphics, and magazine ads tying it all back to their mobile site. In the release, the idea of expanding the promotion to multiple cities is broached – which could be really cool in some of the more densely packed areas. You could start to get participants from one area participating in multiple cities, and really create something cool, and interactive in a big way.